One of the joys of this connected age in which we live is how easy it is for people to connect and collaborate, even at opposite sides of the globe. Nowhere is this phenomenon felt more than in the area of electronic music, where artists all over the globe routinely collaborate to produce amazing work. This release, entitled Ege Denizi, is just such a case. Two of our favorite Earth Mantra artists, Phillip Wilkerson and Gordon Macmillan of Tange, got together virtually and created an ambient album of immense beauty. Thanks be to the digital gods for the internet! And what a release this is, composed of pure light ambience combined with tasteful lap steel guitar licks and soothing synthesizer riffs. When we first heard that these two were going to work together on a release, we knew it was going to be good, but when we first listened we were nonetheless surprised by the delicate and transcendent nature of the music we heard. One of the most striking elements is Tange's lap steel playing, which came as a complete shock to us; we've known him for some time but did not know he played lap steel at all, much less that he had such mastery of the instrument. Combined with the beautiful bed of droney washes, synthesized arpeggios, and drum programming contributed by Phillip, the result is a slice of pure heaven. In fact, we would go so far as call this work an example of synergy. 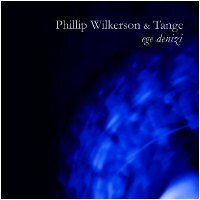 Both Tange and Phillip Wilkerson are very accomplished ambient artists in their own right, having released some of the best music we have heard anywhere at any level. But together, somehow, they have created a masterwork that is even more than the sum of its parts. Remarkable. The more we listen to this music, the more we love it. And we are certain it will have the same effect upon our listeners. So it is with great pleasure we present to you Ege Denizi, by two of the best ambient artists of our time. Certainly, one of the best releases of 2009.